Bright and beautiful color flowers add pizzazz to the bedroom and brightens it up, as it is a terrace level room. I purchased the king size to go on a queen bed and love that it has ample hangover on all sides. 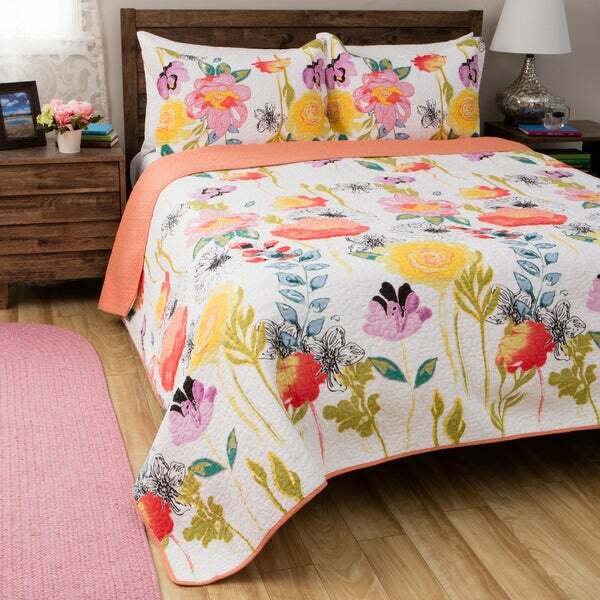 If you like cheer and color in your bedroom, as I do, you will be highly pleased with this quilt set. And yes, weight is very good too! Delivering coziness and stylish charm, this cotton quilt set is a fantastic way to update any bedspread. Each piece in the set is made from machine washable cotton and features a watercolor floral design splashed across the face, drawing inspiration from retro linens. The twin set comes with a quilt and a single sham, but both of the other sets come with a quilt and two shams. A perfect cover for our Hawaii House, bright and well made, including two pillow shams, very happy with this purchase. This quilt is exactly as pictured. The colors are very pretty with shades of baby blue, teal blue, yellow, pink, coral, lavender and a white background. The backside is a solid coral. Very nice and 100% cotton so perfect for living in Florida because heavy comforters are useless here. With all the colors you will have no problem decorating. Also, this is my third quilt from this brand and great quality and washes good. Product is true to the picture. Colors are beautiful and bright, but not in your face bright. The reason I'm giving it 4 stars instead of 5 is because it was supposed to measure 90x90 (queen) and it was 87x90. Keeping it still because the colors are happy and exactly what I was looking for. This is the item that brought me to Overstock. I found this quilt in a different catalog from another company. It was perfect for the bedroom I wanted to place it in. I called the other company to order it. They had a couple of the quilts left, but did not have the shams any longer. I couldn't order the quilt if there were no shams to go with it. I was very disappointed. After a little thought, I decided to just check Overstock to see if they had it. I was pleasantly surprised to find the exact quilt fairly quickly, but not only that, the shams were included with the quilt as a set, and I believe it was the same price point of the quilt alone from the other company. I ordered it on the spot and have been shopping from Overstock since. The quilt is beautiful, well made, and a great addition to the bedroom. I love it! Oh my gosh I can't believe how incredibly beautiful this quilt set it. It had to sell for a lot more than OS charged me. I have a king size, low-profile Tempupedic platform bed and the coverage top to bottom and side to side is wonderful. I don't find it skimpy in the least bit. Also, I washed and dried the whole set before using (I always do this with bedding) and it came out perfect. It is bright and sunny in color so it's not for someone who needs a neutral but it is absolutely fabulous in every single way in my opinion. I bought this quilt as the first one I ordered was on backorder. I ended up keeping both. This is so cheerful, really improved our builder's white and neutral beige carpet! It is getting me in the mood for spring. It does not come all the way to the floor as the picture (king size on king platform bed) but it is long enough. It is machine quilted, a courser fabric, not a fine piece of handcraft. It is easy to wash. Not worried about it holding up with the little dog sleeping on it. Perfect for our casual lifestyle. So easy to make the bed with a quilt! Comes with two pillow shams. Nice! This was a terrific value. I was looking for lighter weight summer bedding and this is perfect. The colors are so bright and it it makes my bedroom a happy place. I ordered a King size for a double bed because I wanted it to be more like a bedspread. It fits perfectly. The shams came in King size also, but I used my standard pillows and they look fine. A little extra material, where they meet in the middle, but I put a couple of throw pillows there and you cannot tell it. Would highly recommend this bedding. I gave 4 stars because of the length - on a new queen bed it needs to be a few inches longer to cover the pillows and not show the end of the mattress. But other than that, I love it. Bought this for my daughter and she loves it. I like that it is cotton and not synthetic. Love the quality and vibrant colors! Love this quilt - bright cheerful colors and great quality. With this beautiful quilt that I couldn't afford on another site and found here for much less and the sheets and chandelier also from Overstock all my friends think I've won the lottery. Lol!!! I still can"t believe it's my room. Just what I wanted! Good quality! The colors are very bright. Everyone absolutely loves my quilt. It's beautiful. It's like walking through a flower garden in full bloom. Made very well and washes beautifully. Really transforms a room. Just the right weight for year round comfort too with an added blanket in the winter months. Love it! It covers the king mattress well. 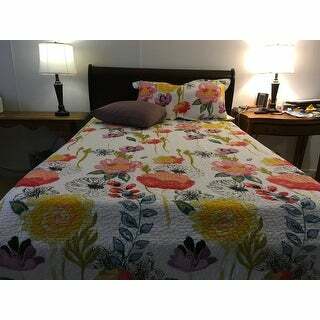 I really love th quilt set for bedroom. My room is kind of dark an shady side. It gives so brighten up to my entire lovely room. was very satisfied with the duvet cover. I love the pattern. It also fits my new queen-sized comforter perfectly with some room to spare, yet my comforter stays in place with the ties provided to attach to my comforter's loops. Delivery time was exactly when expected. The cover is exactly what I wanted. Nice and very colorful bedspread. Not heavy, but more like a light cotton blanket. This is the most beautiful thing ever! I've had it for a pretty long time. The quality is great. This is mot a lightweight disposable thing. It is really a nice weight and it has washed up beautifully. The pillow shams have cute little ties on the back. It's just so pretty! Is light enough to be washed in my washer-I have a lot of company and they all let the animals sleep on the bed with them so I needed something that could get washed frequently. Have not washed it yet but it looks like great quality! "Does this come in twin xl, or is twin & twin xl considered the same with Overstock?" This only comes in a standard twin, a twin Xl is only 1 inch or so longer. "What color sheet can be used with this quilt?" I alternate between a dark teal set and a coral set. Totally different looks, but I like both. I bought a soft orange set and they look very nice with this quilt. Love the combination. "Does the quilt have any orange? Is the green close to a lime green?" Yes there is bright dark orange but mostly a lighter coral. The green is a muted green. I love it---it makes a bedroom cheerful! the colors are true to the picture. Bright and vibrant. The green is not lime. it is more muted like a typical green olive. "Where was this product made?" "Do you only get 1 sham with the full/queen size?" The full/queen, and the king size both include two shams. Only one sham is included with the twin size. "Is there any red in the quilt? My carpet is red." Hello jlp, this item does not feature red tones. Please feel free to contact us again with any further questions. Thank you for shopping with us! It has red, not brick red, but poppy red which is a little pinker red. "Is there pink in this quilt or are the flowers lavender/plum?" Hello Mico, the flowers appear to be more lavender in my opinion. We try to represent the colors of our products accurately. Unfortunately, due to the difference in monitor colors we cannot guarantee that the color will match exactly what you see on your screen. Thank you for shopping with us.